Pink and natural canvas tote will be a stylish addition to any wardrobe. This 12-ounce, 100 percent cotton canvas tote bag can be used again and again for just about anything from your regular items to groceries, beach necessities or farmer’s market finds. The snap-closure holds contents securely. Features shoulder-length 29″ handles for easy and convenient portability. 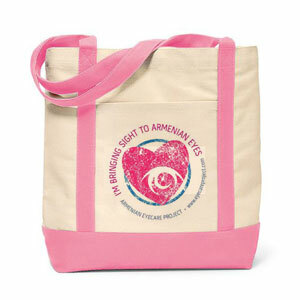 The tote bag is 13″ x 20″ x 6″.